1-Minute Bible Love Notes: God Calls Their Worship a Farce! God Calls Their Worship a Farce! If a father said he'd obey Ephesians 6:4 (nurturing his children in the Lord), but only if his children proved worthy, we'd tell him God's commands aren't negotiable. But when Father's and Mother's Day rolls around, I'm reminded how often I've heard people justify their disrespect and neglect of their parents because they've deemed their parents unworthy. When they do this, they not only judge their parents, they judge God and His commands (Ephesians 6:2). 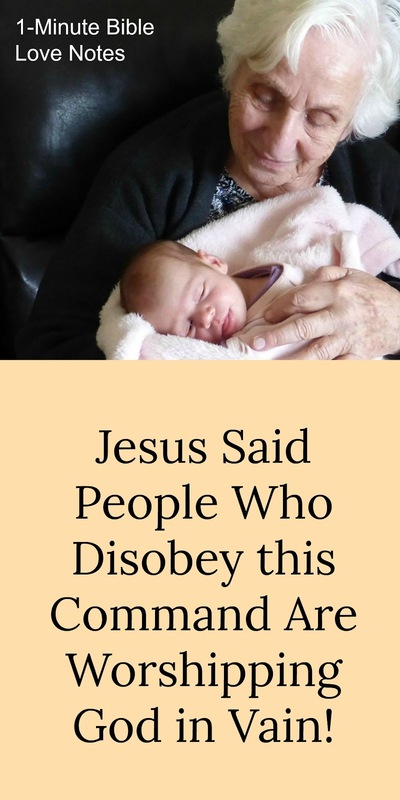 They base their obedience on their perspective (which is usually hindered by a log - Matthew 7:1-4) and underestimate the purposes and effects of God's commands (Isaiah 55:8-9). And God says their worship is a farce (Matthew 15:1-9). 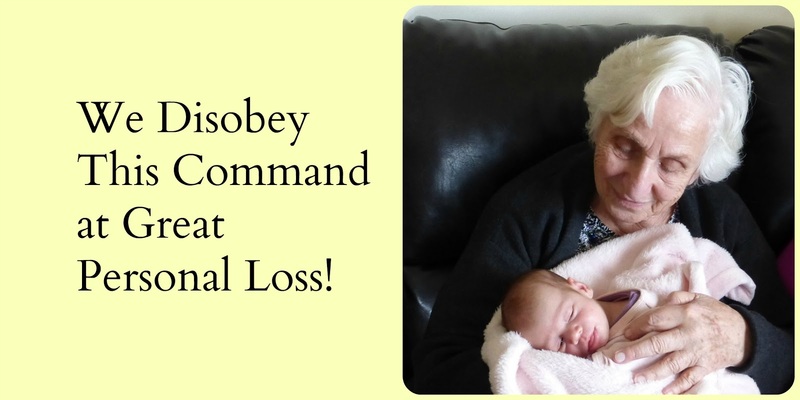 Obeying God's command to honor our parents is about our obedience and trust in God, not about our parents' goodness. Let's quit making excuses, Dear Christians, and start honoring those God says to honor. God knows what He's doing and He promises to bless those who obey Him (Ephesians 6:2-3). Why not think of one way you can improve your relationship with your parents and act on it today. Footnote: We may need boundaries with parents who are physically abusive or mentally ill, but God still expects us to honor them. God knew when He gave the command that not all parents were worthy of honor, but He made no exceptions. I believe disrespect for parents in the Christian community has led to great damage in all areas of our walk and our witness. That's why I often write about it. Please see related posts in the Honoring Parents Archive. I'm having a hard time with this. My mom refuses to have a realtionship with me. I'm wondering how I can honor her? I thought I was honoring her by being the best person I could be, by being wise. I know that our relationship with our parents can be very complex. And there are always going to be people in our lives who seem less interested in us than we are in them. Typically, it's in the opposite direction - children with little interest in their parents. The fact that you care about your relationship with your mom and want it to be better has a lot to say about your character. Good for you! The only advice I can give is to keep loving her and honoring her whether she shows an interest or not. God sees and understands, and He will bless you for your efforts. But I'm also praying a prayer that your mom will change and value you as her daughter. Me too Christine. I honored my mother for 50 years and then she decided to cast me aside and favor my brothers. It's very difficult for me. God also said that favoritism is a sin (see James). What happened? Why? I'm sorry, vcsh, that you are dealing with this situation. Sometimes there is no logical answer for things people do. Yes, many things parents do are sinful. In fact, the best of parents will do things that aren't right. God sympathizes with us. And He gives us the power to honor bad parents even when we don't have the strength in ourselves. It's a wonderful thing to know that we need never do anything in our own strength. And whatever God calls us to do (such as honoring our parents), He gives us the strength to do it. You're right - not many people are addressing the subject. May your book be used by God. My pastor has said to me that by praying for them if distance from them (parents) is necessary is an act of honor. Yes! My mother is a narcissist. She will try to control me and causes huge drama when she can not. She has left many wounds with her words and actions. Kicked me out when I was a child because her husband said so. I was a runaway. I am on great terms with my step dad now. My mother refuses to go to therapy with me. I am going low contact and refusing to argue with her anymore. God does NOT want us living under anyone's control! I'm sorry that you have to deal with this situation. It must be incredibly hard. If possible, let your mother's unkind remarks slide off your back and remind yourself that God loves you. I know this may sound simplistic, but God's Word proves true. Also, ask God to show you something good in your mother and give your mother what you wish she would give you - praise for that good thing. Again, I know that sounds simplistic. And I know it is definitely not easy. But remember that this isn't about your mother's worthiness. It is about honoring God's command. I pray for you, Shilo, as I write this, that you will draw from Christ's strength because we are able to do all things through Christ (Philippians 4:13). First, honor does not equal obey. Check out Gal 4:2 It’s the verse often over looked when parents throw out the “obey your parents” in order to gain control over adult children’s lives. Second, children are only under their parents authority until they are adults. Lastly, that does not mean we still don’t honor (respect) them or that we don’t set boundaries against their toxic behaviors. Hope this helps. Dear shilo,I understand what it's like to deal with an abusive parent. My suggestion is to pray for your mom and talk to a Christian counselor. I did. I had to get away from the abuse so i could heal. Now many years later my finally have a good relationship with that parent. God will work things out for good. give it time. I adored my parents as much as they adored me.Now I see all our conflicts were insignificant and unnecessary.